『자치통감강목(資治通鑑綱目)』은 남송의 주희가 사마광이 편찬한 『자치통감(資治通鑑)』294권을 저본으로 하여 편찬한 강목체 사서(史書)이다. 조선조에서 처음 간행된 『자치통감강목』은 1422년(세종 4)에 간행된 경자자본(庚子字本)이다. 그 후 최초의 연활자(鉛活字)인 병진자(庚子字)로 강(綱)을 인쇄하고 목(目)과 주석은 초주갑인자로 인쇄한 책이 발간되었으며 이는 1438년(세종 20)에 사정전훈의『자치통감강목』(思政殿訓義『資治通鑑綱目』)으로 알려져 있다. 이번에 지정된 『자치통감강목(資治通鑑綱目)』권12, 27, 37, 42는 1493년(성종 24)에 명판본 『자치통감강목(資治通鑑綱目)』을 자본으로 주조된 계축자(癸丑字)를 사용하여 간행된 책이다. 본문과 주석에 모두 구두(句讀)가 백권(白圈)으로 표시되어 있어 독해에 도움을 준다. 또한 잔본이 4권 4책(권 12, 27, 37, 42)이나, 계축자는 국내에 인본의 전래가 드문 귀중본이다. 표지는 제책 당시의 원형을 유지하고 있으며 전체적으로 보존상태가 양호한 편이여서 그 가치를 더한다. 이 『자치통감강목』에는 의정부 산하의 ‘사인사(舍人司)’라는 인문(印文)이 군데군데 날인되어 있는 점이 특이하다. 특히 권42에는 본문(本文)의 중간 중간에 교정지시(校正指示)가 필서(筆書)되어있어 교정본(校正本)임을 알 수 있다. 『자치통감강목』은 역사학·정치학·행정학·서지학 등의 연구에 귀중한 자료로 활용될 수 있을 뿐 아니라 조선시대 전기의 금속활자인쇄술 연구에도 크게 활용될 수 있는 자료이다. 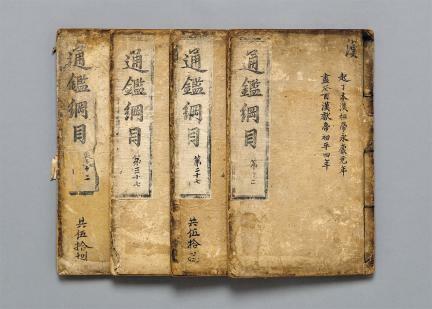 Jachi tonggam gangmok (Itemized Comprehensive Mirror for Aid in Government), or Zizhi tongjian gangmu in Chinese, is a book compiled by a great thinker of Southern Song Zhu Xi (1130-1200) on the basis of Jachi tonggam (Comprehensive Mirror for Aid in Government), or Zizhi tongjian, written by Sima Guang (1019-1086). 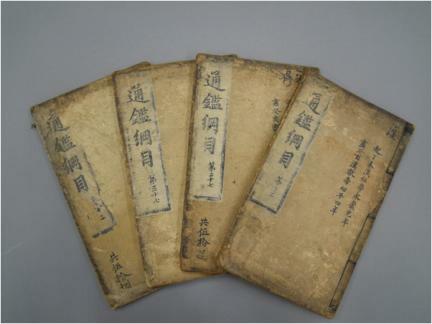 These volumes of Jachi tonggam gangmok were printed using the Gyechuk Types cast in 1493 by copying the Ming types used to print the book of the same title. All the punctuation of the main texts and notes was done with white circles designed to help the reader comprehend the meaning of the texts. As only four volumes of this edition of the book remain (nos. 12, 27, 37 and 42), it is highly regarded due to the rarity of books printed with the Gyechuk Types. Each volume has its original cover and is in very good condition. 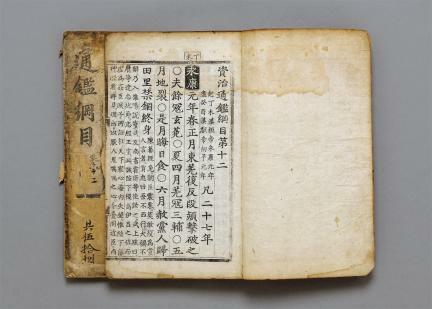 Characteristically, the volumes of this book contained seal imprints in places which relate themselves with the Sainsa (Secretary’s Office) of the Uijeongbu (State Council). The main text of Volume 42 includes handwritten instructions concerning revisions that had to be made, revealing that it is part of a revised edition. These volumes can be fruitfully exploited by studies of the history, politics, administration and bibliography of Joseon as well as the development of movable metal types during the early Joseon Period.